Michael Doyle is the name. I’m sorry if you aren’t following this blog. I really mean that. If you haven’t read this guy, you are missing out. Stop doing that. Read it today. Then make sure you come back often. I can’t continue to dig deep reading the blogs of influential educators without stopping today to make sure a few more people are reading what I am. Perhaps it is because Mr. Doyle, the “Science Teacher” as his blog is entitled, is deeply creative. Perhaps it is because he seems to have the integrity to follow his philosophy as a mission statement. Or maybe it is more about the fact that he too, is a science teacher. That is the easy connection for me. I thought about linking to this blog a few weeks back, and instead aimed my comments directly to the author on the pages of the blog. After reading today’s post, What I know now… I decided that’s it: time to share with my readers once and for all. Honestly, I needed this post today. After the end of yesterday, I needed to be reminded once again why I work as hard as I do. I have always attacked every aspect of my job as a teacher or coach as if it were my 170lb. opponent standing two feet away from me on the mat. While teaching my third period Dual-Credit Biology course, I felt like a king. It was one of those 80-minute slices of life that remind you of why you work so terribly hard. (the online “after-discussion“) As an instructional coach, I get those rewarding slices of time less often than I did when I was in the classroom full time. When I am able to design an event on the scale of a classroom… twenty-five kids, four walls and me… I more-often-than-not-feel like a maestro. When I scale up any endeavor to include the building level, it feels less powerful, less connected. However, those events are still frequently very rewarding. When it is then scaled up to some district-level event, it too often feels less savory. Perhaps this is just an indication of a lack of intimacy. This morning while writing this, I think maybe I now understand yet another facet of my own personality. I think I need intimacy. Sharing new things with 100 people in a room can be really fun. Working on a district level committee toward enhancing instruction can be quite rewarding. However, when there are too many strong personalities in one room it gets tough. Too many chiefs and too few indians perhaps. Too little social intimacy for sure. One thing I learned in the classroom years ago is that often the most valuable thing I can do as a leader is to listen. How do I help steer the discussion in a way so that students can make their own meaning? How is it that I can lead by doing less and end up achieving more? I listen. I’ve become fairly good at it. I get it now. Allow me to suggest a surrogate. Read Michael Doyle. From a careful case made about the disconnect between science and language, to the near poetry of November Light, or the grounding thoughts of Clamming and Competency. Poke around the site for a bit, you’ll find something you personally like even better. What do I find here? I find nothing short of inspiration in the creativity and thoughtfulness of the author. I find reminders that “goal directed exhaustion is OK.” Sometimes when I can barely even sleep due to professional fatigue… I really need that reminder. This doctor-turned-science teacher deserves a wider audience. I hereby nominate Mr. Doyle’s Science Teacher as the “Best Teacher Blog” in the 2008 Edublogs Awards. I am now off to fill out the nomination form……. Aguiar, Leonardo. “Sea Shells 4.” articotropical’s photostream. 31 MAY 2007. Flickr. 22 Nov 2008<http://www.flickr.com/photos/sensechange/523219230/>. Audet, Rick. 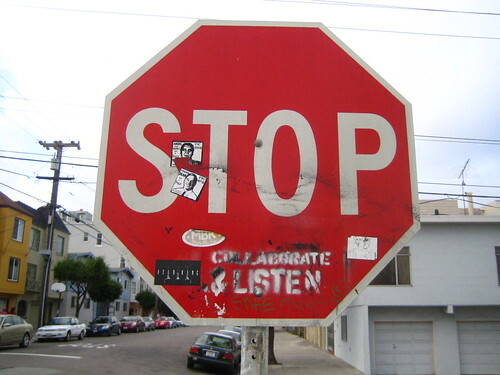 “Collaborate & Listen.” rick’s photostream. 07 OCT 2006. Flickr. 22 Nov 2008 <http://farm1.static.flickr.com/44/263214639_3a3503c31a.jpg>. Previous Article← How do you spell constructivism? As a recent follower I am pleading…continue with your cathartic messages and insight. They are contagious and reassuring. Exactly what I need. Too often I sink into a solo-pity party since there can not possibly be anyone else who feels like me; who cares like I do. No one who stays up waaaaay too late designing & redesigning activities for maximum differentiation; no one who lays awake formulating another plan of action for that student who continues to be apathetic no matter what I do. Your posts bring me back with re-energized enthusiasm. A welcomed kick-in-the-pants. Thank you for sharing the “Science Teacher.” Incredibly empowering. I will follow religiously from today forward. To all administrators: In addition to listening to those educators who are speaking only to get your attention by saying what it is you want to hear, please seek out those educators who never say “boo.” Find the teacher who drives the car that is always in the parking lot as you arrive & still there as you leave for the day. Listen to them. You will be glad you did. Thanks for the warm words (and the plug). Finding others with similar thoughts (you, Clay Burell, quite a few others) helps me preserve my sanity (or perhaps we are simply plunging together into the same abyss). We create our own universe(s) here, dangerously seductive. I’d be lying if I said that I don’t get a thrill from seeing my site listed in the blogrolls of other teachers I admire, and my favorite blogs have been ones I’ve found through suggestions of people like you. The whole Eddie thing, though, is a bit over the top. One of the liberating things about blogging is the lack of pressure. Most of us are not selling anything but ideas, most of us are not running ads on our sites. 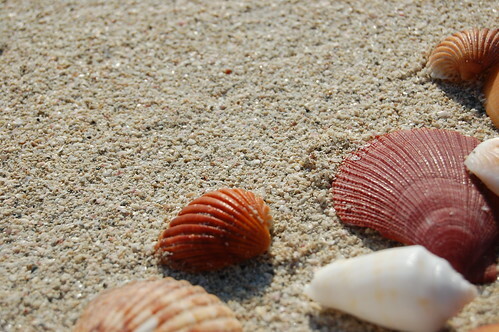 Reading through blogs is like beach combing. Ah, here’s a lovely shell, a smooth stone, a whelk necklace, the glistening dome of a dying jellyfish. We might toss the shell back into the water, maybe pocket it, most times just leave it there and keep walking, lost in moments. Giving awards for beach combing would take away the timelessness of its moments. A good beach walk is its own reward, and if I ever started worrying about the quality of what I find, I might cover more beach and find more perfect specimens, but I’d have lost something more valuable. At the risk of sounding ungrateful, I’d like to keep beach combing without pressure, and decline the nomination. @ MD – heh. The fact that you are a humble person not remotely in search of accolades only makes your little chunk of cyberspace all the better. The nomination is for exactly what you are doing. Best “teacher” blog. Just keep teaching… turning over smooth stones… and keep selling the ideas. I have the feeling that whether 10 or 100 people read, you will still be feeling and saying the same things. This is a weird award, I agree. In my opinion it really isn’t about “merit” the way we normally think of it. To me it is about recognizing the folks who retell their experiences in a way that supports the work of others. I admire your final comment, but honestly… if you write to the web… you write for all of us. You don’t have to decorate your site with awards and nominations to make it worthwhile. I suspect that if others feel the same as I do, you can proudly slip your award into your top drawer at home and continue beachcombing for those of us not so close to the shore. And while I think the Eddies are dubious in many ways (and wrote a post biting the hand that fed me last year, which i linked to under my nomination banner for a few months), Michael, putting the damn thing (and Alltop badges, and anything else that communicates to first-time visitors that you’re not some tin-foil-hat-wearing…oh, waitaminnit…some dog pawing a keyboard in human underwear) up seems to me worth it, in the balance, since anything that helps a writer’s ideas reach more readers is, um, sort of one of the things most writers want to do. @ Clay – Excellent. A second. This could now actually go somewhere. As evidenced by a post of two here in the past few months, I really DO love it when the “right guy” wins. What is particularly beautiful about your nod here is the boldness. “Deal, Doyle” – I can’t lie and say I wasn’t actually laughing off and on here for a good five minutes while reading that. Cheers! Thanks for sharing the “Science Teacher” with us nashworld. His “What I Know Now” post was extremely uplifting, and served to reaffirm what goes on through my head daily – I had specific reasoning for becoming a teacher – and that reasoning still sticks today. I often wonder, when I sit around what might as well be the teacher’s lounge and listen to the verbal vomit of negativity, Why did you even get into this profession? Why did you choose this for yourself? It could not have been the draw of the almighty dollar…so what was it??? Perhaps sharing these seven reasons will help some of those who aren’t totally convinced that teaching isn’t all bad, and maybe it will help some of them remember how badly they wanted to ignite that spark or encourage that sense of wonder within a child. I got the nomination. Thanks! You got the same one, which makes it that much sweeter. Hey Doyle! You certainly did- though really, I had no doubt you would (though I sure didn’t know much about how those things really run.) But yes, that was my mission. The rest of the process is less impressive to me. I consider this a win as of right now. Yeah- my name? Same list? Pretty funny, but it is touching. Phosphorylates my ADP a bit. I would have been a much better fit in the newb category at best. Stacy Baker sent in that nomination. Have you seen hers? She is up the page here on the right. The “extreme biology” group blog is by her kids. Also really good stuff. Cheers is right! -and mission accomplished.